Ideal for correcting: barking, chewing, jumping up, digging, and much more. Convenient remote unit requires no collar-receiver. Positive tone feature reinforces commands without correction. Effective operating range up to 30 feet. FCC Approved. Remote Training Systems are designed to assist in the training and the behavior modification of your dog. The Remote Training Systems were created to help dog owners deter unwanted behaviors from a distance. It can be used to control any misbehavior that you see your dog exhibiting by using the transmitter to send a clear ultrasonic signal. After a few corrections your pet will begin to avoid the misbehavior. Eventually the same effect can be achieved once your pet associates the tone with the correction, by using the negative tone only. 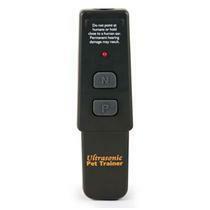 The Ultrasonic Remote Pet Trainer is a small, hand-held device designed to assist you in the training of your dog or cat. Ideal for correcting misbehaviors, it takes advantage of your pet's sensitive hearing in the ultrasonic frequency range, beyond the range of human beings. The Trainer has only two buttons: Positive Tone for reward, and Ultrasonic Tone for correction. It's that simple! This has been a popular item with mail carriers and meter readers to repel unwanted advances from neighborhood dogs.